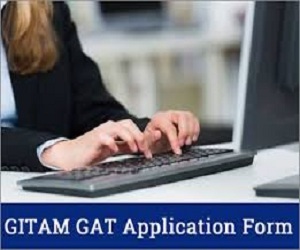 GITAM University will release the application form of GITAM GAT 2019 in both online and offline mode. The application of GITAM GAT 2019 will be made available in the second week of November 2018. While filling GITAM GAT application form candidates have to enter their personal and academic details, upload/affix their passport sized photograph and make the fee payment. Candidates who have passed or are appearing in class 12 with Physics, Chemistry and Mathematics and securing minimum 60% are eligible to fill GITAM GAT 2019 application form. To know how to fill GITAM GAT application form 2018 and other relevant details read the article given below on this page. Filling in the personal details: Applicant must fill all personal details in the required fields. Candidates have to fill details such as name of the applicant, date of birth, gender, nationality, religion, category, name of the parent/guardian, address for correspondence, city, state, pin code, phone number with STD code(optional), mobile number, email ID, test centre preference, test code, name of the college (the candidate is studying or last studied), select subject – PCM /PCB. Uploading of Photograph: Candidates have to upload scanned recent passport size colour photograph in pdf format. Size of the photo image must be greater than 4 kb and less than 50 kb. Dimension of photograph image should be 4 cm (width) x 4 cm (height). Edit application form: After photograph has been uploaded, candidates can modify or edit any of the information that they have entered in GITAM GAT application form 2019. Online payment– Applicants can pay the fee using credit card/ debit card/ net banking. Offline payment– The application fee of GITAM GAT can also be paid through Demand Draft (DD) drawn in favour of ‘Director Admissions’ payable at a Scheduled Banks and reach the address mentioned below before last date. Details of DD should be filled up in the online application. After entering DD details such as DD number, DD date, amount paid and Bank, click ‘Submit’ button to complete the transaction. Selected Banks: Applications are also available throughout India in selected branches of Union Bank of India, Indian Bank and Karur Vysya Bank.